My European trip. 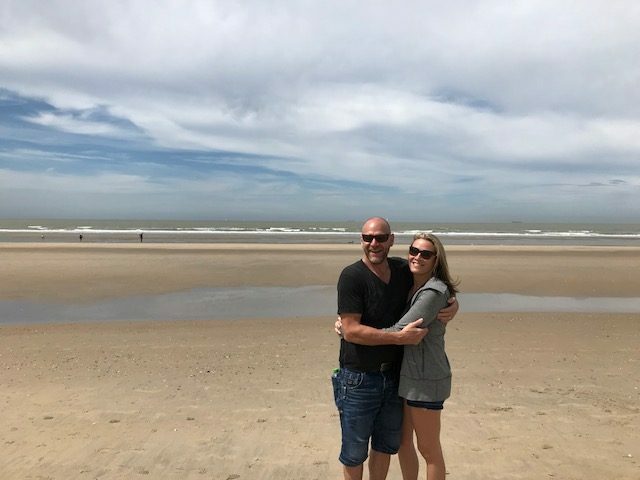 What started this journey, and of which our trip was planned around, was going to a family reunion in De Haan, Belgium. I have two step-brothers and extended family that all live in different areas of Brussels and Antwerp. Every couple of years my parents travel to England and Belgium to visit both sides of the family. There was talk about this being their last year to go as they are now finding the traveling too much for them. I have been meaning to go to Belgium for years so this was the deciding factor. My husband, Rick and I showed up at the family reunion unbeknownst to my Mother & Step-Father and surprised them all. They were both very taken aback seeing us suddenly appear and we all burst into tears and laughter. It was very surreal to share that moment with the family knowing that it was probably going to be the last time my step-father will see his sons. 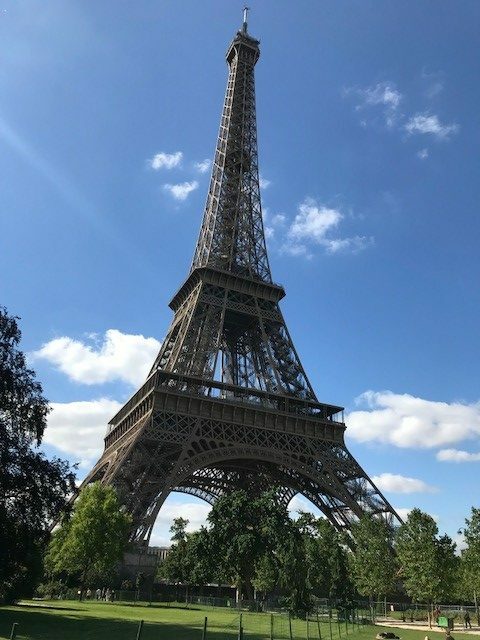 We flew through Paris, which was a bucket list for me, before heading to Belgium by train. 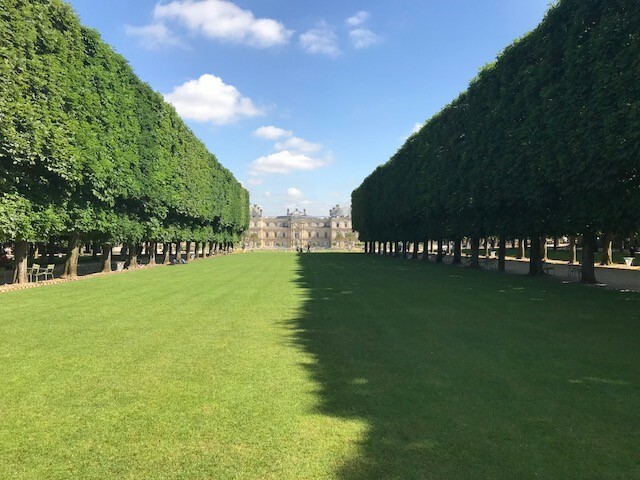 We spent three nights that barely scratched the surface, but we saw everything we wanted to see on the first day, Eiffel Tower, Arc de Triomphe, Notre Dame, Louvre and Luxembourg park. My iphone Health app recorded us walking 43.9 km!! We stayed at Hotel Les Dames du Pantheon which had a spectacular view of the Pantheon, hence the name. We could have reached out the window and touched it. We gorged ourselves on amazing bread, pastries, cheese and of course wine. We wandered the streets aimlessly with no direction in mind, never knowing what’s going to be around the next corner. North America is such a baby compared to Europe; the history and architecture is just mesmerizing. Not wanting to spend any time during our short stay in line ups with the crowds we opted to do only one tour, the Catacombs. 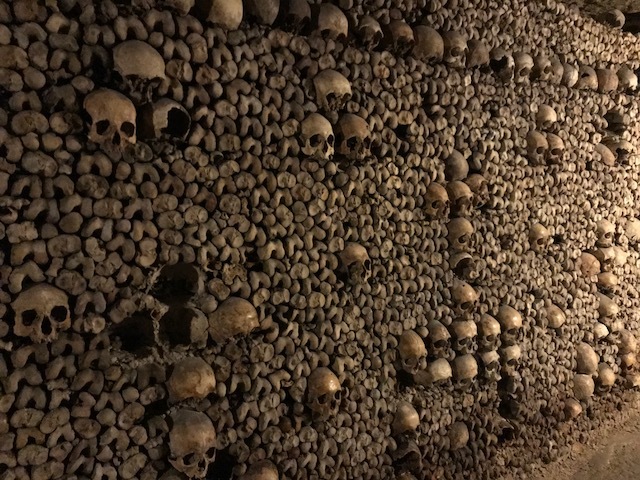 Walking through the low ceiling tunnels of the ancient stone mines amongst the bones of six million people was not for the faint of heart but incredibly interesting. I would recommend doing the private VIP tour. With a small group of 8 people at most, you are guided through areas that general admission does not allow. From Brussels, Belgium we got on a plane to Zagreb, Croatia. Our time in Croatia was complimented with the World Cup games and we were lucky enough to be in the town square to partake in the celebration of one of their wins. The crowd went wild and immediately linked arms and started singing their national anthem. They take their football very seriously. From Zagreb we rented a car and headed to the coast. First stop Rovinj. We stayed outside the old city in an apartment not far from the Adriatic Sea. We spent our days cycling along the sea wall that lead all the way to the old city, which was picture postcard beautiful. Tiny narrow streets made of cobble stone polished to perfection from years of foot traffic over centuries. From there we made one day trip down to Pula that boasts the 6th largest coliseum in the world. If you listened carefully you could hear the roar of the crowds cheering on the gladiators as they battled their opponents. 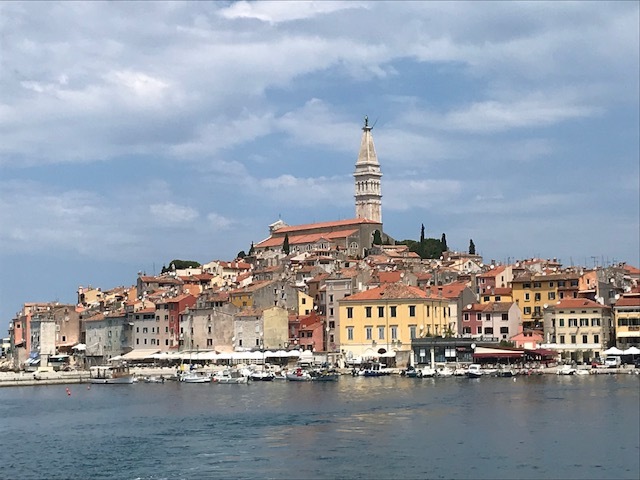 After four nights in Rovinj we got back in the car and headed south to Zadar. This small towns current claim to fame are the man-made Sea Organs. As the waves move through tubes beneath the marble steps a very haunting sound is created. The whole town seemed to congregate at sunset to sit on the steps to be serenaded by the organs as the sun went down. Very romantic! Now on to Brela for our last four nights, my favorite part! Brela is on the Makarska Riveria. Beach after beautiful beach surrounded by a rocky mountainous terrain. 14 kilometers of sea wall to wander from town to town if you can pull yourself away from your beach chair. 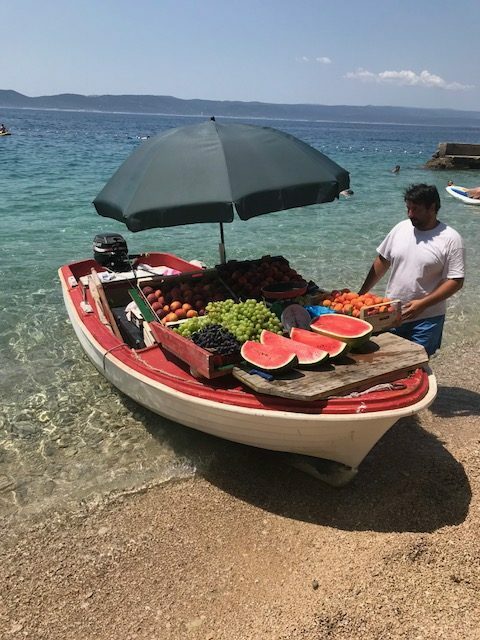 Fresh fruit delivered each day by boat driven right up to the beach. 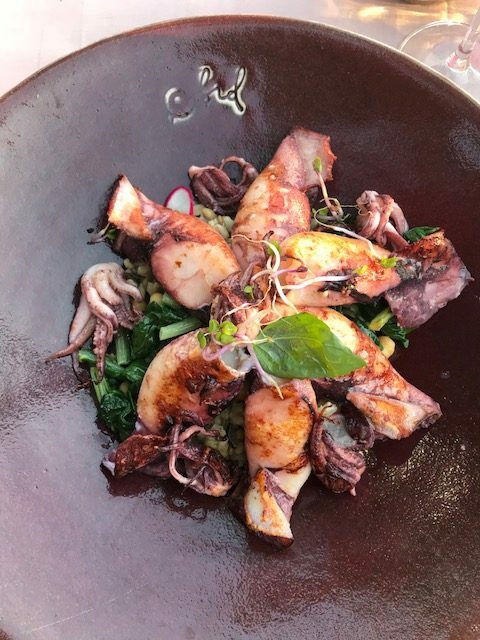 The food, oh the food, I am pretty sure I ate Croatia out of all their squid. Grilled to perfection and served with a basil and garlic infused oil. Yum!! With a heavy heart we spent one last night in Paris before flying home.